So, last night I finally got around to it. And oh my, was it good! Warm, creamy and full of pungent Gorgonzola cheese, this was just about the best imaginable side for a steak. 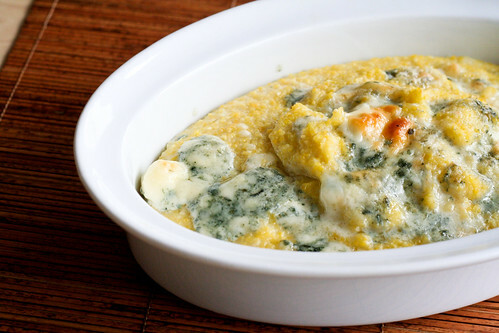 Mashed potatoes and creamed spinach can step aside – it’s Gorgonzola polenta that will cuddle up with my skirt steaks and rib eyes. Next time, I think I’ll add some pickled red onions or shallots sauteed in butter to balance the creaminess of the polenta. But honestly, it’s amazing just the way it is. Feel free to use blue cheese if that’s easier for you to find. Just as good either way. Place the polenta, salt and water in a saucepan and bring to a boil over medium-high heat. When it comes to a slowly rolling boil, cover and reduce the heat to low. Simmer for 25 – 30 minutes, stirring occasionally. Mix in half the Gorgonzola and stir until it’s melted throughout. Place the polenta in your favorite casserole dish and cover with the remaining cheese crumbles. Place the casserole dish under your oven’s broiler for 5 minutes (or less), until the cheese is just melted over the top. Serve alongside a nice, juicy steak. Wow this sounds delicious. I’m putting this on my list of recipe’s to try! I must make this! I just got back from The Store (there’s only one in this small town) and looked for the Bob’s brand, as they carry a few of his other items, and no luck. The only kind of grits to be found are the Quaker regular and instant. Would either of these work, do you think? Here I am with some locally-made Amish gorgonzola in the fridge, but no polenta. Wah. Well, maybe the villa in Tuscany to go with it! I love how simple this dish is! It does look like the perfect side dish to just about anything! I LOVE Gorgonzola and they have great prices for it at Trader Joe’s. You’re right, this would be the perfect accompaniment to steak. However, I’d be happy to eat it by itself, by the spoonful. Hey Melissa… thanks for posting this! Polenta was the very first dish that my hubby and I shared together, on our first date! Can’t wait to recreate this. P.S. my hubby works with your bro, Danny. Wow! As soon as I get back to the states I will make this! I am bowing down in front of my computer chanting “I am not worthy”. (Think Wayne’s World!) Thanks for all the amazing recipes and entertaining posts! Agreed. Any cheese in polenta is bound to be delicious. We were doing parmesana, queso fresco and feta for a while. Gorgonzola sounds like a must try. Awesome picture! It looks so rich and delicious. oh my goodness…creamy and delicious…this is warm comfort food! I’ve just read your recipe for ‘Pesto Shrimp w/Pancetta & Parmesan Polenta’ and am definitely going to make it later on this week, but I LOVE gorgonzola; would gorgonzola be too overpowering for the other dish, do you think?? this is incredible! i served it with filet mignon for xmas dinner, and i made it again tonight w/ harina de maiz instead of regular instant polenta [not sure exactly what the difference is] — more work, but similar consistency, and still delicious!